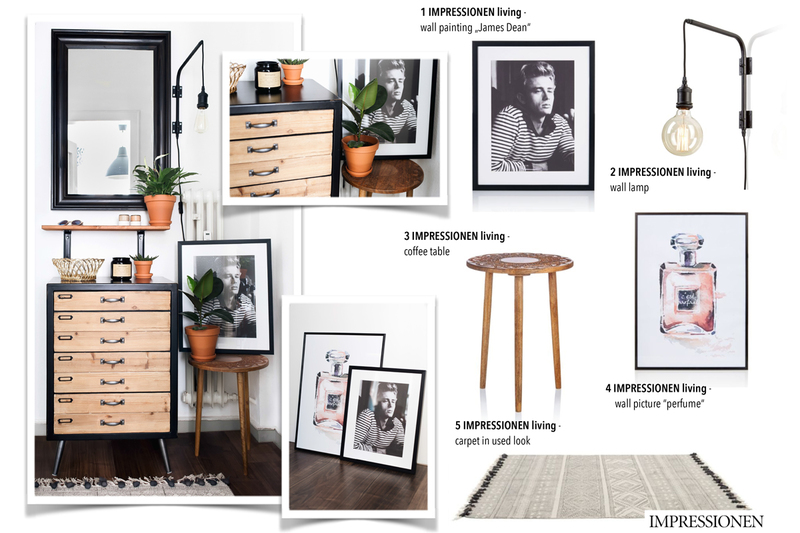 Some weeks ago I somehow thought it’s about time to redecorate my flat and share all the interior impressions with you. The first home story chapter is about my fresh decorated hallway in collaboration with one of my favorite interior (and clothing) online stores: IMPRESSIONEN. But first of all some good news: by using the code SK9PET7CUR you’ll get 10 € discount (75 € minimum order value) at their online store. The code is valid until October 21. I asked myself where to start the home story and thought why not starting exactly where you enter the flat – the hallway. 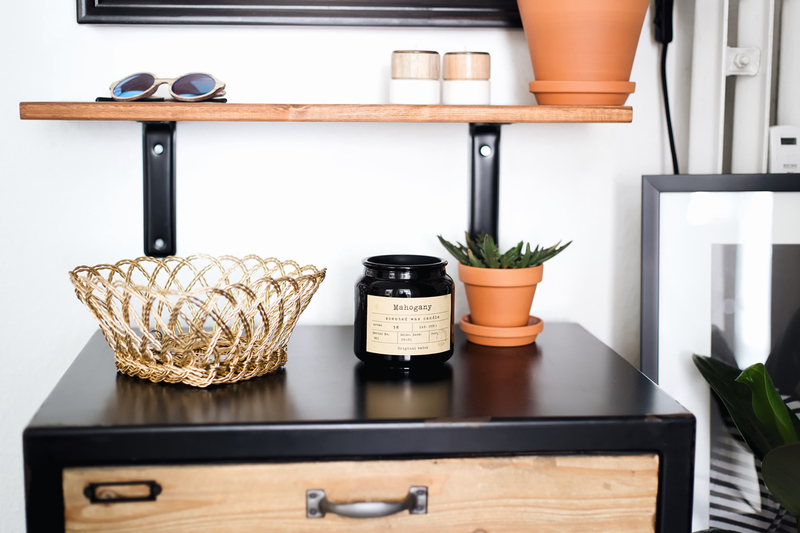 Inspired by this Pinterest picture, I decided to keep it pretty simple with wooden details, industrial design elements, decoration in black & white and some terra-cotta flower pots. Although I really love the current industrial design trend, I mostly think it’s a little too clean. So, most important to me was to create a harmonious combination of urban design and homely atmosphere. 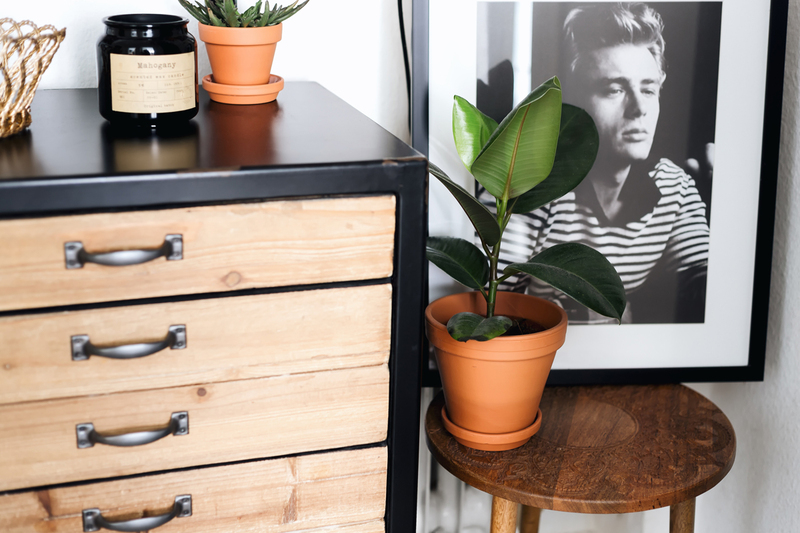 The dresser, the wall lamp and the candle in industrial design bring the requested urban chic, while the wooden coffee table and the terra-cotta flower pots make it appear a little more friendly and homely. The black white used look carpet and the black white James Dean wall picture round out the look. 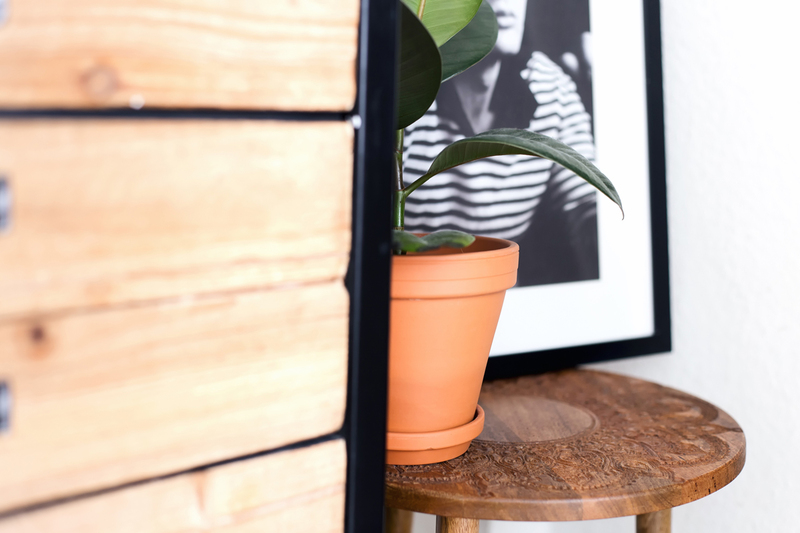 And there’s no need to hang up all your pictures – you can as well lean them against the wall to make it look a little more urban and unconventional. Ich habe lange überlegt, mit welchem Wohnbereich ich meine Home Story starten soll und dachte letzten Endes, warum nicht einfach da starten, wo man die Wohnung betritt: im Flur eben! 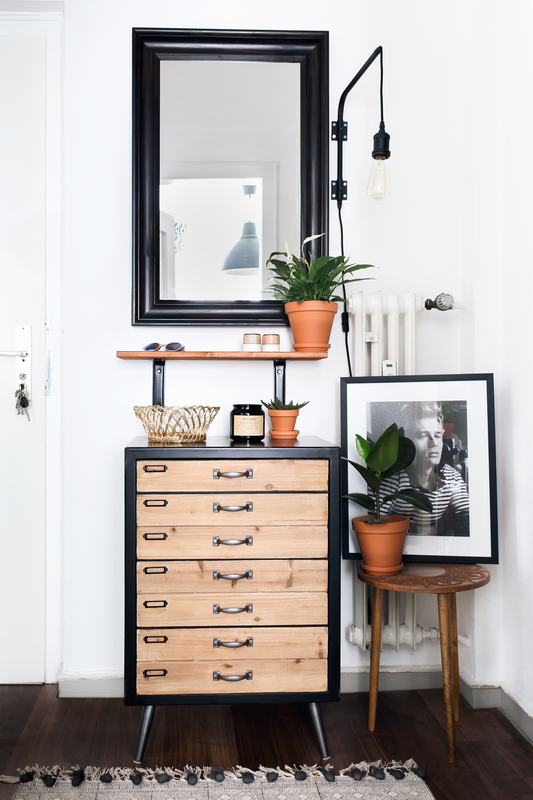 Von diesem Pinterest Posting inspiriert, habe ich mich dazu entschieden, den Flur relativ simpel mit Möbeln aus Holz, schwarz weißer Dekoration, Industrial Details und Pflanzen zu halten. Auch wenn ich generell großer Fan des Industrial Designs bin, ist er mir insgesamt oft zu clean und kühl, sodass es mir besonders wichtig war, eine harmonische Kombination aus urbanem Design und gemütlicher Wohnatmosphäre zu schaffen. Die Kommode, die Wandlampe und die Kerze im Industrial Design verleihen dem Raum also die gewisse “Coolness”, während der Beistelltisch aus Holz und die Terrakotta Blumentöpfe den Wohnbereich etwas wärmer und gemütlicher erscheinen lassen. 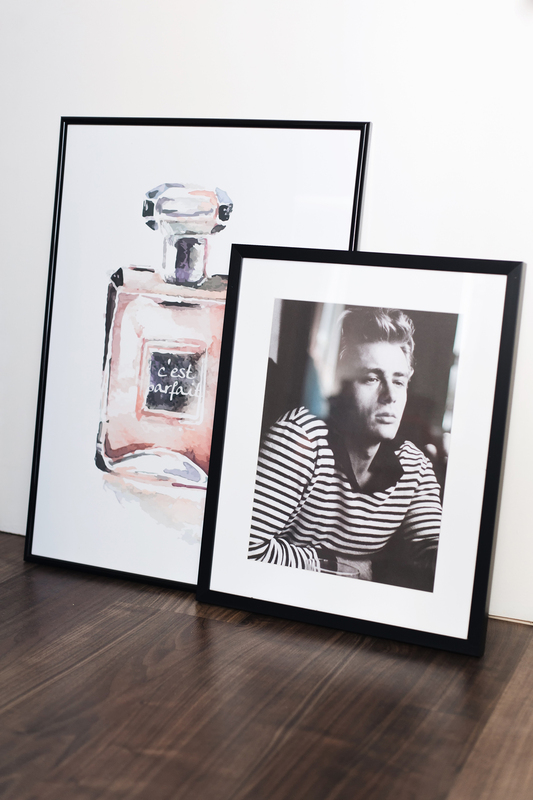 Der schwarz weiße Used-Look Teppich und das schwarz weiße Bild von James Dean runden den Look ab. Bilder gehören übrigens nicht zwangsläufig aufgegangen – an der Wand angelehnt haben sie wiederum eine etwas urbanere und unkonventionellere Wirkung. 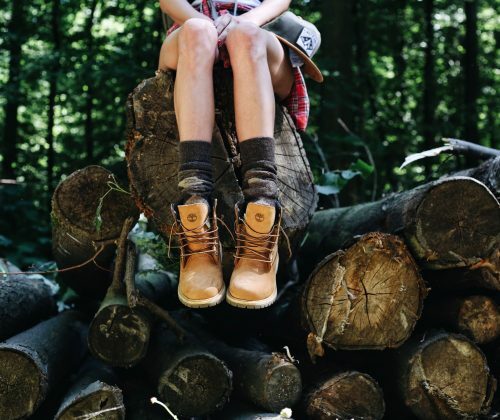 Wooooow, so schöne Fotos!! <3 Bin von dem Look total begeistert… und ich glaube das James Dean Bild muss ich mir auch ganz schnell bestellen. Freue mich schon auf weitere Interior Posts von dir. das sieht klasse aus! genau mein Geschmack! !